Why Is Australia The Most Successful Immigrant Nation? Let’s take a look at the statistics! Australia’s population currently stands at 24 million and 28 percent of those residents were born overseas. Additionally, if you consider Australians with a parent born in another country, that number rises to about 40 percent. The world comprises of 195 sovereign nations. A further 90 of those nations have a population in excess of ten million. However, no other country has been so generous in receiving migrants when compared to Australia. Saudi Arabia boasts a 32 percent immigration rate. However, residents born in a different country are only classed as guest workers and do not have the same sovereign rights as migrants. In the past 200 years, Australia has attracted immigrants from across the globe. This often followed a crisis such as the Irish Potato Famine. Furthermore, economic benefits have also played a part in attracting immigrants from around the world. Most migrants arriving in Australia will head to Sydney or Melbourne, living in enclaves formed by tribal and familial bonds. Modern cities also provide an infrastructure for many different ethnicities. Therefore migrants benefit from schools and churches which support their culture. In the 1960s, different nations settled in different pockets of Australia’s cities. Italians settled in the Carlton area of Melbourne. The Greeks called Sydney’s Marrickville their home and the Irish settled in the north of Melbourne. Sydney is also home to Arabic speaking communities and Vietnamese immigrants. During the last 60 years, these separate communities started to merge into one. Furthermore, their cultures and traditions have been accepted into everyday Australian life. The Australian people swapped tea for coffee and started to kiss each other on both cheeks, just like the Europeans. 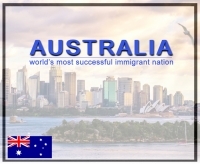 So is assimilation the reason for immigration success in Australia? Experts are keen to highlight that it is not just one culture converting to another, but cultures fusing. It is about selecting bits of each culture and creating something new. New York used to be the city known as the melting pot. However, only 29 percent of New York residents were born overseas. Sydney is a standalone example, with 42 percent of the population born overseas. This does not mean that Australian citizens all live in complete peace and harmony. Problems between different races and ethnicities exist. Despite any tensions, Australia can be proud of a generous immigration system that has allowed people from all over the world to prosper.